Bimota Forum :: View topic - SB7 Wanted. Thatll be New Zealand and not OZ, i could ship there to make Brian 3bims but then id still be looking and poorer . The SB6 is an ex UK graphite/red model with 5000 miles on the clock, the owner says number 1156 of 1200. It only has one photo which isnt that great but its only 2.5hrs away from where i live so its not a big deal to check it out. 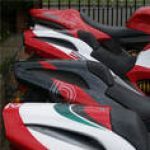 Not sure how to do the website link stuff but it is on www.motorcycletrader.co.nz if anyone wants to have a look and give me their opinion about it. To me it looks like the number plate holder has been removed/modified as i cant see indicators and there is no front indicators either. I guess i do know how to do the link stuff, theres only one Bimota listing so it shouldnt be too hard to find. Cheers for the link. Computer land is not my natural habitat and still find myself being a stranger in its vastness. Are you saying its possible to put a V-twin motor in a SB6 chasis? I might have to have a look at that it could even make it better(that sir is a joke and no offence intended ). Yeah send it over, i'll look after it for ya . 3bims... mmm, that's got a nice ring to it. About time a got me a YB i recon. It looks pretty clean and tidy. No indicators and no mirrors either, may have been a track bike?? I haven't seen that colour before. Get the seller to send you some more photo's and closeups. Text says it's a '99 model, i didn't think they made sb6's that late, maybe just an error. Worth a look i recon. Let us kmow how you get on. Good spotting on the mirrors, i hadnt noticed they wernt there. Will probably call in the next week, its been listed for awhile so hopefully there could be movement in the price. The SB6 is still for sale, in the end i didnt bother ringing him as i still have a SB7 want on the brain. I did however see that the SB7 is back on speuders.nl so i think? ive just sent him a email asking for price. I think? because after i sent the email a few things in Dutch came up that my computer didnt translate so maybe i didnt. Does anyone have a direct contact for this guy that they can send me? Im over thinking about it and after seeing everybody elses stables growing its finally time to pull finger and do something. Even with the issues this bike has its still one of my dream bikes so figure what the hell im 40 in September so i might as well have a SB7 mid life crises. On a sadder note my IOM plan fell through so itll have to be next year. On a happier note the Phillip Island GP is on the cards, ive never seen a GP race so am looking forward to that, my friends went last year and had a lot of fun so some are going again this year. Cancel that request, email did go through and im going to start the process of purchasing the bike. there is no better reason to buy a bike. Any bike. You want one, simple. Good luck. Have you also seen this one..?